C-GLMT at Lac Sébastien base, Québec. • IM-1716 Indian Air Force. Delivered 17-Jan-1958. Withdrawn from the inventory on 31-Mar-1991. • No Regn Mike Hackman Aircraft Sales / La Ronge Aviation, La Ronge, SK. • C-GLMT Air Saguenay (1980) Inc., Jonquière, QC., who rebuilt the aircraft. Based Lac St. Sébastien, near Chicoutimi, QC. Regd May 1996, 23-Apr-1999, 23-May-2003 & 02-Sep-2003. Power plant: Converted to Vazar turbine. Winter 2005 / 2006. Otter 216 was delivered to the Indian Air Force on 17 January 1958 with serial IM-1716. After test flying at Downsview, it was packed into a crate and shipped to India where it was re-assembled and entered service. During 1962 IM-1716 was serving with 59 Squadron and saw action that year in the war against China, flying troops and supplies from Tezpur to Walong. The Indian Air Force continued to fly the Otter until the type was formally withdrawn from the inventory on 31 March 1991 and the surviving aircraft were offered for sale. 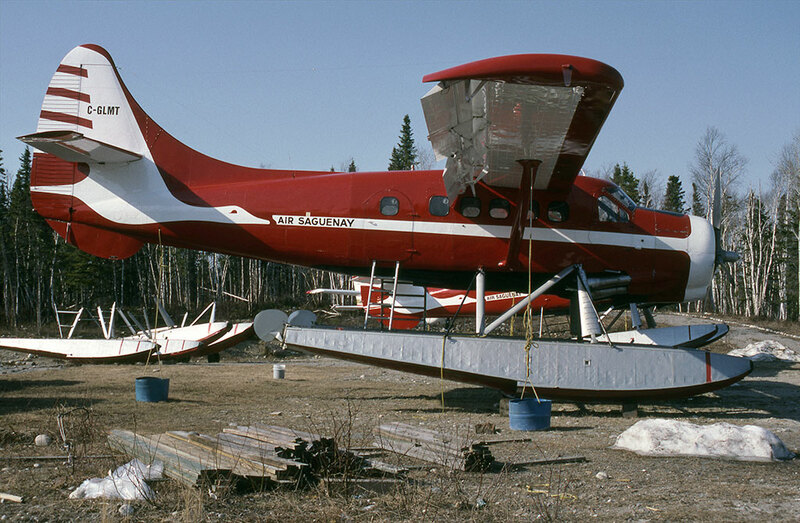 The successful bidders for the Indian Otters were Mike Hackman Aircraft Sales / La Ronge Aviation, who travelled to India to prepare the Otters to be shipped back to Canada. IM-1716 was located at Gwuahati Air Base, Assam. It had accumulated 5,883 hours total time in Indian Air Force service. It was one of four Otters shipped from Calcutta, and arrived in Saskatoon in late January 1995. 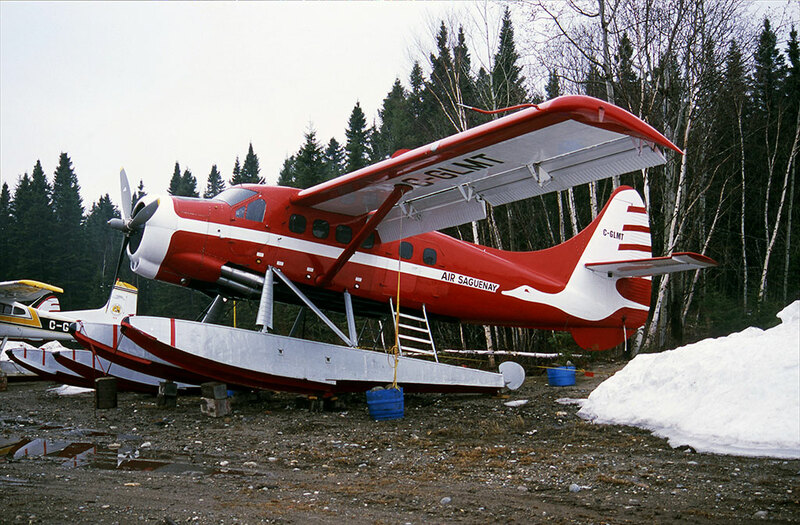 The Otter was sold to Air Saguenay (1980) Inc., who rebuilt it and to whom it was registered in May 1996 as C-GLMT, based at Lac St.Sébastien, near Chicoutimi, Québec. It was painted in the attractive Air Saguenay red and white “goose” colour scheme. For the next few years, the Otter flew for Air Saguenay serving the bush country of Québec. Over the winter of 2005 / 2006 it was converted by Air Saguenay as a Vazar Turbine Otter with a PT-6A-34 engine and continued service as part of the large Air Saguenay Otter fleet. It is mentioned in a CADORS report for 29 March 2006, when it arrived at Goose Bay from Alexis River, which is in the Canadian Air Defence identification Zone (CADIZ), without filing a flight plan. There was another CADORS report on 31 August 2009. Otter LMT had conducted a VFR flight from southeast of Chibougamau / Chapais to Lac Cache. The pilot did not communicate with the Rouyn flight service specialist after landing. The Sûreté du Québec found the aircraft on the ground later that day. “There was a meeting with the pilot who said he would pay special attention to the flight log and arrival report!”. For summer 2010 Air Saguenay partnered with Nisk Air services to establish a base at Lac Matiawashish in the Baie James area of northern Québec and based Otter C-GLMT there to better serve the needs of customers in that area. LMT remained registered to and operated by Air Saguenay but acquired Nisk Air Services fuselage titles and logo, while retaining the basic Air Saguenay scheme. It was on floats for summer 2010 and wheel-skis for winter 2010 / 2011 and then back on floats for summer 2011. During this period it flew hunters and fishermen and also supplied exploration and mining camps. It continued in service with Air Saguenay in the years that followed. There was another CADORS report on 12 May 2016. The Otter was on final approach to the landing strip at the Meadowland gold mine in Nunavut. It was on a low shallow approach in low light conditions and struck a snowbank at the threshold, but landed safely. It continued in service with Air Saguenay for summer 2017.